In this article we will explain the concept of RadPivotGrid and RadPivotFieldList - we will explain the basic terms, when you should use RadPivotGrid and when not, we will explain the idea of aggregations and calculations and how important they are, we make a comparison between RadPivotGrid and RadGridView to help you in your decision which of the two controls to choose. This is the Items Source that we will use through the whole article to explain what is RadPivotGrid and how does it work. DataProvider - this is the object that holds the data for RadPivotGrid and RadPivotFieldList controls. There are three predefined data providers - LocalDataSourceProvider, XmlaDataProvider and AdomdDataProvider which can be used in different cases. Each DataProvider has four important collections that are used by RadPivotGrid and RadPivotFieldList to visualize the data: RowGroupDescriptions, ColumnGroupDescriptions, AggregateDescriptions and FilterDescriptions. More information for DataProvider is available in our Populating with Data article. Rows, RowGroupDescriptions and Row Headers - these terms are inseparable. RowGroupDescriptions is one of the collections in the DataProvider which is used to populate RadPivotGrid and RadPivotFieldList with data. For our ItemsSource RowGroupDescriptions can be Name, Promotion, Price and Quantity defined as PropertyGroupDescription or DoubleGroupDescription. RowHeaders are the values of the properties defined in the RowGroupDescriptions collection. For our example RowHeaders will be "Pen" and "Pencil". Columns, ColumnGroupDescriptions and Column Headers - these terms are also inseparable and are following the same logic as Rows. ColumnGroupDescriptions is a collection of the DataProvider which holds data that will show up in the Columns of RadPivotGrid. 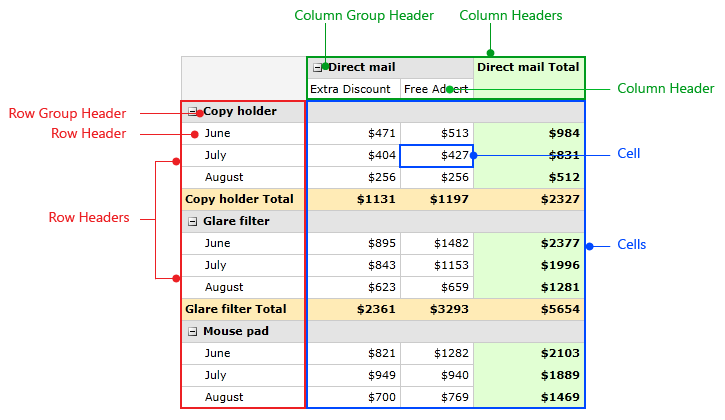 Column Headers are all values of the properties added in ColumnGroupDescriptions collection. In our example the only property added as ColumnGroupDescription is "Promotion". 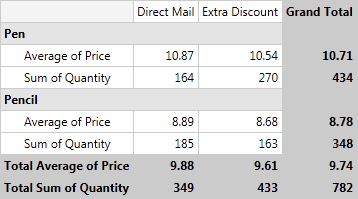 Column Headers will be "Direct Mail" and "Extra Discount". AggregateDescriptions, Aggregates and Cells - each Cell of RadPivotGrid shows data. This data is in numeric format and is aggregated based on some description. The aggregated value is shown in the exact location where the column and row intersect each other for a particular object. 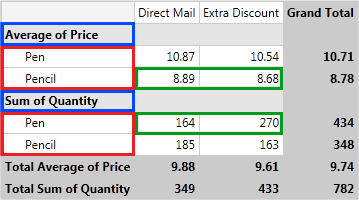 As we have defined Average Aggregate for Price property using PropertyAggregateDescription RadPivotGrid will calculate the average value of the Price for each of the GroupDescriptions. 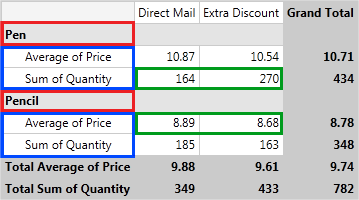 So the average price of "Pen" which is in "Promotion" "Extra Discount" will show in the exact place where these two groups intersect each other. You can see how the items in red and blue rectangles have changed their positions and how the values (in green) have changed. 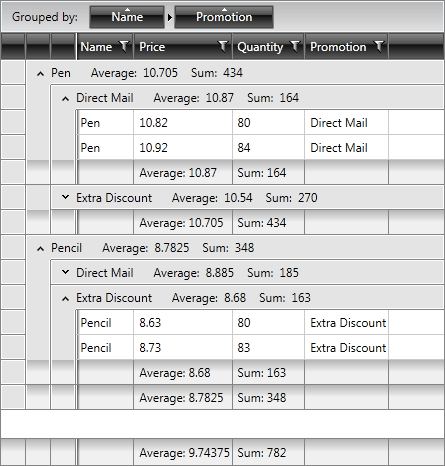 GrandTotals and SubTotals - by default RadPivotGrid shows GrandTotals and SubTotals for each of the rows/columns. GrandTotals show aggregated data for all groups. SubTotals appear when you have more than one item defined in your RowGroupDescriptions/ColumnGroupDescriptions. SubTotals will appear for each group which has SubGroups in the hierarchy of Group Descriptions. RadPivotFieldList - a powerful control for applying modifications on the DataProvider at runtime. If you have RadPivotGrid and RadPivotFieldList and they are using the same DataProvider, you can modify your pivot at runtime with RadPivotFieldList. Combination of these two controls is a very powerful business intelligence tool. The red rectangle on the image shows all public properties from the DataProvider - you can use them as group descriptions or aggregate descriptions. The blue area shows each of the four collections of the DataProvider (RowGroupDescriptions, ColumnGroupDescriptions, AggregateDescriptions, FilterDescriptions). The green area is used to define if your changes should apply immediately (when Defer Layout Update checkbox is not checked) or when you click the Update button (you are able to do it only when the checbox is checked). You can use the checkboxes in the red area to add items in your collections or you can do it by using drag-drop. You can apply runtime modifications (filters, sorting, etc.) by clicking on an item in a group description (Promotion for example) - this will show you menu with modifications you can use. You can do the same for the aggregates by clicking on them (Average of Price for example) and modify the aggregate function that is applied or the type of calculation. In "Row Labels" you can see a special group description named "Values" and a special symbol in front of it. This is indicator for the AggregatesPosition - as it is in the "Row Labels" it means, that our AggregatesPosition is Rows. You can notice that it is after the "Name" group description, which indicates that the AggregatesLevel has value 1. 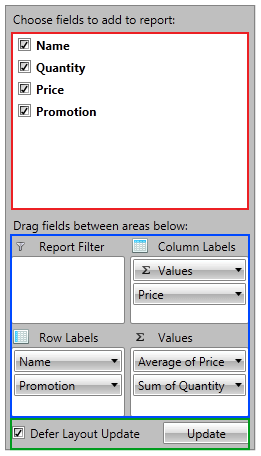 You can easily modify these two properties by dragging the "Values" to the desired place (for example if you want to set AggregatesLevel to 0, just drag "Values" to be above "Name" in "Row Labels"). RadPivotGrid is very powerful control that provides different aggregation functions, calculations and grouping mechanism for your data. But how to decide if this control is exactly what you need? Well, here is a short list that should give you the answer of this question. You have data that needs grouping. For example you have a hundred items with ProductName = "Pen" and you want to show a single entry for them. You need aggregation. If you don't want to show only the values that you have defined, but you need to apply an aggregate function for them. You want to do some calculations - for example "Difference From", "% of GrandTotal", etc. You want to be able to modify generated report at runtime - combine RadPivotGrid with RadPivotFieldList and generate totally different reports at runtime. In some cases you may get confused which control to use - RadPivotGrid or RadGridView. The main difference between the two of them is the view of the data - if you want to show all of your items - you need RadGridView. 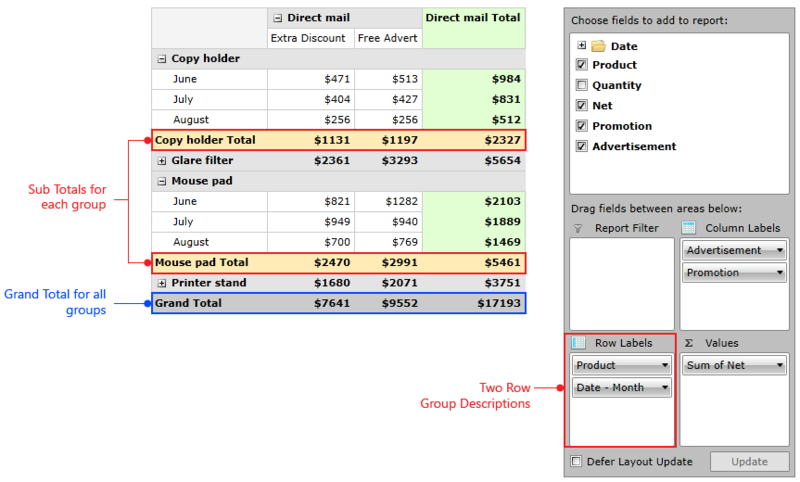 If you want to show only grouped data and different aggregates you need RadPivotGrid. If you want to show your data items then use RadGridView. RadPivotGrid shows only groups and aggregates (without data items behind these groups). The differences are obvious - RadPivotGrid is grouping data in Rows and Columns and shows only grouped values, while with RadGridView you are able to expand/collapse all groups and you can see each data item.